Wow! This is a wonderful example how good consultation and understanding your audience can lead to great quality information! 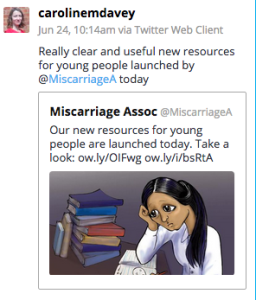 The Miscarriage Association has identified a need for materials to support young people, who have different experiences and support needs. The consultation, planning, and promotional plans show excellence in producing health information. This shows through in the end products – high quality and extremely well-tailored to the audience. The insight and thought that has gone into this is commendable. Take for example the ‘what happens when you call our helpline’ page – simple, highly visual, concise and reassuring information to encourage young people in need of support to dare to pick up the phone – the overall impression is one of kindness. Just wonderful. Thank you for an engaging and informative workshop. The content was exactly what we had hoped for and was delivered in an interactive way that meant I was able to get the answers to questions that have been challenging me for the last 6 months. Your workshop has helped us find answers to some of the dilemmas which we were facing around moderation and enabled to move forward in a confident and informed way that will ensure the success, sustainability and safety of our online forum. 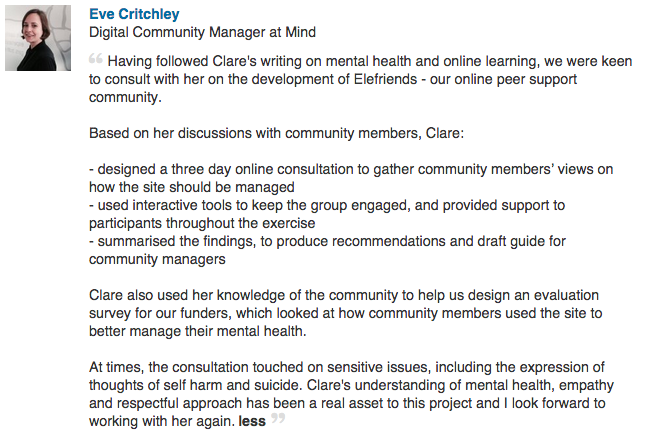 We have worked with Clare to develop our online community and her expertise and professional manner have been invaluable. She works with us as one of the team and it is easy to trust her to deliver high quality work. Her manner with users and staff alike is fantastic and she has helped us to find bespoke and resourceful solutions for building and developing our online community. 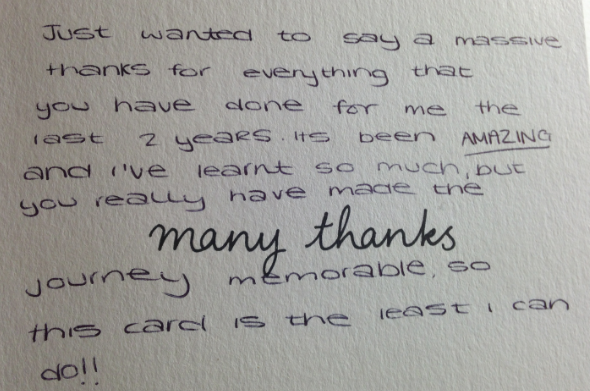 Thank you Clare! It was such a fantastic day, I’m really pleased with how it turned out. Thank you so much for all of your hard work before hand and on the day – it was incredibly useful for myself, as well as all the volunteers who attended, and I feel much more confident going forward. I’m so glad my colleague found your info online, you have such a brilliant understanding of OCD and tailored the training perfectly to fit with our Charity. “A thorough, well-paced and thoughtfully structured workshop. A great introduction to the topic providing plenty of points to consider. I just wanted to say what an amazing author you’ve been to work with, you’ve got such a lovely writing style and a real dedication to developing your content so that is supportive, respectful, and really connects with your readers. I’ve been really impressed by all your hard work and how thoughtful you are. Mind is lucky to have you writing for us. 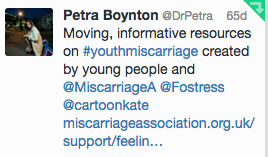 I have reviewed a number of pieces for Mind and this was the most comprehensive and easy to navigate and understand. It was written simply but not simplistically and had a great deal of information written in an informative and straightforward manner. I wanted to thank you again for all your hard work on this resource. It’s been really rewarding and interesting to work on, and the content was of the highest quality right from the get-go.